Rev. Phillip Kettering left Providence in November, 2015. We our in the process of forming a call committee etc. 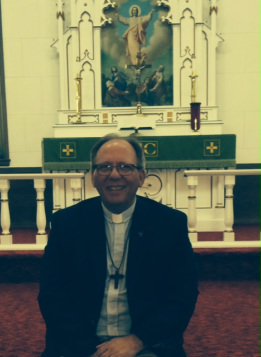 The Rev Phillip Kettering was called to serve at Providence Valley Lutheran Church on June 1, 2014. Pastor Phil was born in Billings, MT and was baptized on May 20, 1956 at First English Lutheran Church. He was raised in Montana until his family moved to San Antonio, TX where he resided until graduating high school. Pastor Phil returned to Montana to complete his undergraduate education in Business Management. He then began a 20 year with ARCO (an oil and gas company) that required him to relocate to Atlanta GA, Los Angeles CA, Anchorage AK, Dallas TX and back to Alaska in 1990 where he remained for the better part of 14 years. He is the proud father of a daughter, Kaley, who is a graduate of Pacific Lutheran University (Psychology), the University of Denver (Counseling and Social Work), and is currently residing in Denver, CO as a grief counselor. Pastor Phil's call to ministry came later in his life. After leaving ARCO during a corporate merger, he took a sabbatical to be a full time father and determine what God had planned for him. His journey of discovery would eventually take him to Pacific Lutheran Theological Seminary as a resident MDIV student. He remained in Berkeley CA for over a year until family needs took Pastor Phil back to Alaska. In order to continue his call to pastoral ministry he transferred into TEEM (Theological Education for Emerging Ministries). Pastor Phil completed his academic work in TEEM and was ordained on March 28, 2010. It is during a TEEM gathering that Pastor Phil met Pastor Janet Colby from Canby, MN. Trusting in God along the way, Phil and Janet continued to develop the love they shared over several years and were married on February 8, 2014. Pastor Phil previously served Trinity Lutheran Church in Palmer, AK (2006- 2007), Epiphany Lutheran Church in Valdez, AK (2007- 2014), and now resides in Dawson, MN where he is serving Providence Valley Lutheran Church. He enjoys fly fishing, golf, billiards, and cooking in his spare time.